After three blissful Italian vacations, the striking scenery of Sorrento had settled snugly into Carmen Buono's memory. Glorious sunsets off the hotel balcony. Stunning cliffs of the Amalfi Coast. The woman he loved -- his wife, Barbara -- at his side. Then, in 2002, at age 63, Buono returned to Sorrento with friends, one of them a Franciscan monk. He again inhaled the coastal beauty, aching more than a little as he thought of Barbara, who had died two years earlier. And he felt drawn, for the first time, to voice what had been on his mind for months. He wanted to become a Roman Catholic priest. The monk replied Buono was too old to join the order. But once home in New Jersey, Buono spoke with Paterson Diocese clergy, who seemed open, and in 2004 he entered a specialized seminary. Now, on Saturday, he will be ordained, becoming one of a small number of Catholic priests with children. And apparently the oldest new Catholic priest in the country. The Church is ordaining 475 priests in the United States this year. In New Jersey, the Paterson Diocese will ordain four; the Newark Archdiocese, 13; the Trenton and Camden dioceses, five apiece; and the Metuchen Diocese, one. Buono's age -- he turns 69 on June 17 -- makes him an anomaly among priests even in a Church where the ages of newly ordained priests have been rising. The average age is 35 this year, up from 28 in the 1960s and 26 in the 1940s. As a national shortage of Catholic priests has worsened, bishops have come to rely more on "second-career priests." Buono, a retired therapist and public school principal who raised a family in West Caldwell, says he decided to become a priest be cause he wanted to exert his energy in a meaningful, spiritual way after his wife died. And while he liked dating, he did not want to re marry. "I was committed to her in the marriage, as she was to me, and with that ... not here all of a sud den, I knew I needed something more," he said this week. "And it directed me toward my vocation. I feel it (the priesthood) is absolutely the right thing for my life, because of ... what had occurred." Paterson Bishop Arthur Serratelli, who will ordain Buono and three younger men at the Cathedral of St. John the Baptist in Paterson, says he is unfazed by the prospect of a priesthood starting at a time of life when most people contemplate retirement. "Moses was 80 and Aaron was 83 when they were given their call," said Serratelli. "Look at the pope: He (Benedict XVI) took over running the church at 78. "Age has changed. The way we look at age has changed. A lot de pends on health, energy and commitment. ... Like any new priest, he has to learn, but he has a lot to offer and he'll approach the ministry like a very zealous 68-year-old person. He's very energetic." 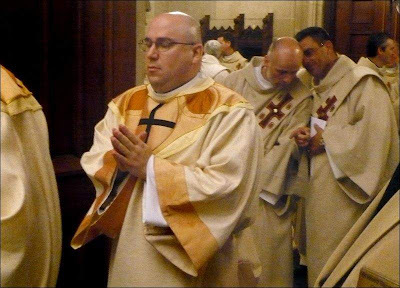 Lest anyone forget, the three years since Serratelli's arrival in the Northwest Jersey diocese -- Catholic population: 420,000 -- have seen its number of men in formation zoom from 6 to 38. The ordination of a single Catholic priest in Detroit on Saturday, when dozens of young men once stood nervously before the altar in this annual ritual, was a poignant reminder of the dire shortage of clergy in the country's largest denomination. Next spring, a half dozen priests are expected to be ordained, although some could have second thoughts before then, said the Rev. Jim Bilot, director of vocations for the Archdiocese of Detroit. "I'm praying that more Catholics become aware that they need to play a role in this by encouraging people they feel are called to consider the priesthood," Bilot said. One of the priests who laid his hands on the head of Camilleri to complete his ordination was Msgr. Michael LeFevre, who is not only rector of the cathedral but also is the pastor in charge of supervising three other nearby parishes. Because there are so few full-time priests, LeFevre is able to keep all four parishes running only by continually recruiting priests, mainly men who have weekday jobs outside the church, to help him out with weekend masses. This kind of parish clustering is becoming a common part of Catholic life across the United States. There are 70 million U.S. Catholics, including 1.5 million in metro Detroit. "I was ordained 25 years ago," LeFevre said after the mass. "And, even back then we could see what was coming. We'd talk about, 'So, what will we do when the shortage gets bad?' Now, we're living right in the middle of it." Despite the situation, everyone at the cathedral seemed to have enthusiastic praise for Camilleri, who has been assigned to St. Joseph Catholic Church in Lake Orion. "He's got such energy and compassion for people," said Julie Owens, who taught Camilleri in the early 1990s when he was a student at St. Mary's high school in Orchard Lake. Owens was so eager to express her praise to her former student that she scurried out of the mass fast enough to be first in a line of hundreds who greeted Camilleri in a sometimes rainy outdoor reception. Camilleri, 30, grew up in Farmington and says he felt called to ministry while working on a bachelor of science degree in health and fitness at Central Michigan University. He switched career goals and spent nearly eight years in programs at Sacred Heart Major Seminary in Detroit. Camilleri added a personal touch with a salute to his father, Anthony Camilleri. As the mass ended, the new priest had an opportunity to address the crowd -- and quickly focused on his father in the front row. Describing how his father always carried a rosary and made no secret of reciting a daily cycle of prayers, Camilleri told his father, "You taught me that praying is something that a man can do and should do."